Our Beef Bouillon adds a bold new taste to your next meal with the rich flavors of beef stock, onions, carrots, parsley and spices. An easy way to make a dish stand out, it pairs wonderfully with recipes like our Beef Picadillo. Beef is rated 4.6 out of 5 by 75. 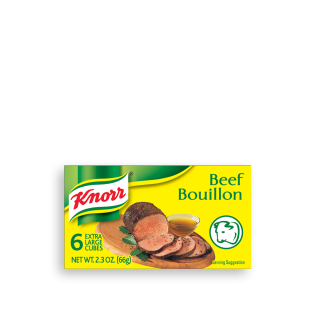 Rated 5 out of 5 by Helen from Love the Beef Bouillon cubes- now unavailable I have nothing but great things to say about this or any other Knorr products. However, they are simply unavailable!! How can I go about getting them?? Rated 5 out of 5 by alisonm797c from The secret ingredient to all of my stews! I boil up the water, toss in a cube, whisk it up then add all the stew ingredients. It makes everything taste just so perfectly juicy and you really only need one cube for a big stock pot stew. The price is affordable even when not on sale - especially when you factor in that if you go with two whole cubes for each stew - one box will last you for at least three big meals. Much better than using the liquid broth in those tetra packs. I used to cook with those til I realized the Knorr Cubes got me more for my money and tastes much better than the watered down stuff. This is a main staple in my place and I will for sure keep buying it, and recommend it to everyone that has working taste buds!